The war was over and Dad was coming home at last! But the days and weeks go by, and when he does return Dad is not the happy man that young Rita once knew and Thomas thinks he remembers. Struggling to understand his sadness and fears, the kids accompany him as he readjusts to home life, all the while singing his favourite song. 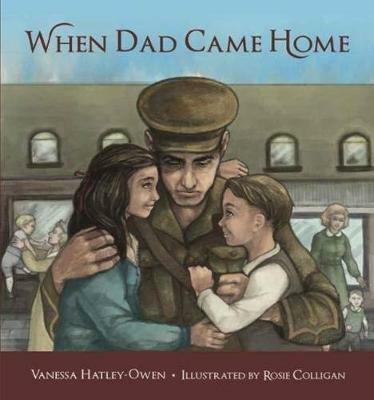 One day, while they help him fix the deck, Dad starts to join in the song ... Hatley-Owen beautifully captures a children's view of the return of the war and the realities of shell shock for the men who returned after the First World War ended on 11 November 1918. Vanessa Hatley-Owen is a children's writer who has published with Learning Media and been an NZSA mentee. A secondary school teacher, she lives in Howick, Auckland. Rosie Colligan has illustrated for book and commercial clients in New Zealand and internationally, and formerly worked at Weta Digital. She lives in Wellington.